"Jodhpurs in their modern form are tight-fitting trousers that reach to the ankle, where they end in a snug cuff, and are worn primarily for horse riding. The term is also used as slang for a type of short riding boot, also called a paddock boot or a jodhpur boot, because they are worn with jodhpurs. Originally, jodhpurs were snug-fitting only from just below the knee to the ankle and were flared at the hip; modern stretch fabrics have allowed jodhpurs to remove the flare and yet remain supportive and flexible." 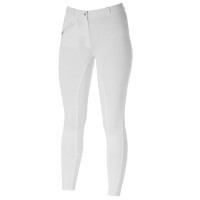 "Riding breeches are specifically designed for equestrian activities. Traditionally, they were tight in the legs, stopping about halfway down the calf, with buckles or laces in the calf section, and had a pronounced flare through the thighs that allowed freedom of movement for the rider. 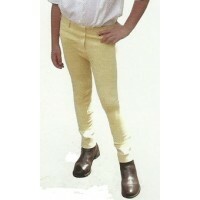 However, with the advent of modern stretch materials such as spandex, modern breeches have no flare and fit skin-tight. Zippers and velcro fastenings have replaced laces and buckles at the calves as well. The flared style is seen at times, and is available to cavalry and other historic reenactors." The junior version of the Horze Active Silicone Full Seat breeches designed for younger riders. 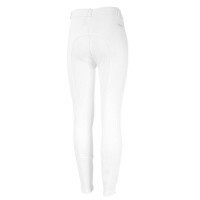 Grea..
Ladies' cotton knitted breeches with a normal waist. Features two front zip pockets and a Velcro bot..
Stay put in the saddle with the fantastic grip on these silicone-print full seat breeches. The elast..
Denim breeches with stretch suede, details on the pockets and a better fit. Stretchable fullseat. 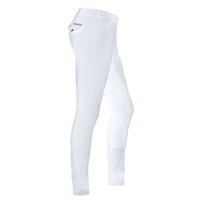 D..
Horze Grand Prix Ladies Full Seat Riding Breeches offer comfort as well as a professional and stylis.. The synthetic leather full seat provides plenty of security in the saddle when wearing these men's b.. The Hipster Jodhpur with Suede Seat is a high quality performance hipster cut jodhpur, featuring a f.. 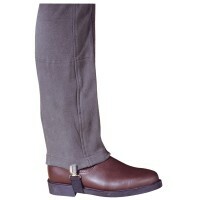 The Hipster Jodhpur with Suede Seat is an ultra resilient performance jodhpur with a comfortable hip.. The Hipster Jodhpur with Self Knee Patch is a hardwearing, budget-friendly jodhpur perfect for activ..
RideRite pull up jodhpurs, made from cotton and spandex for stretch. Knee patches for extra protecti.. These have an ultra-grip insert on the seat. Combining a knitted Cotton/Lycra with a synthetic suede.. The Hipster Jodhpur offers a durable, quality jodhpur in an updated hipster cut. A rich Cotton and S.. The Medium Waist Jodhpur is a smart fitting and hard wearing riding essential. A Cotton stretch blen.. 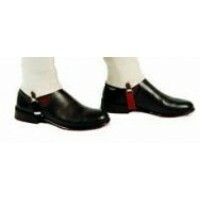 The Jodhpur with Self Knee Patch offers a superb fit at a great price. A high performing blend of Po.. 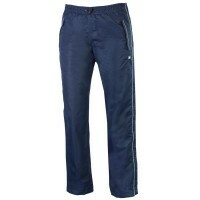 Perfect trousers for rainy weather; completely waterproof and breathable fabric with taped seams. Fu..